We all know that I have an issue with fabric...so let's not even go there as I proceed to tell you about the newest sale at fabric.com. Now I've purchased a bit from fabric.com over the years and there are some finished garments made from their fabrics residing in my closet as well as some pieces still residing in my fabric closet. In all honesty, I don't purchase as much from them as I do from my beloved Fabric Mart, but hey we all have our favorites! So the reason that 27 yards...yes I said 27 yards...of fabric are on their way to my apt is because somehow, someway, the owner of fabric.com got his hands on 1000s of yards of fabric from Vera Wang's Lavendar Collection. And believe me I had a hard time paring it down to just 27 yards!!! The sale is going on until June 22nd...but I would hurry on over and check it out before the really good stuff is gone! *LOL* And then let me know what you got...and I will let you know what I got too! I'm more than excited! Just what I needed on yet another rainy, dreary day here in NYC! You are such an enabler! I'm looking at Fall fabric and it looks delicious! I was going to leave exactly the same comment as Erica! Go on, enable me some more. Like I need an excuse to buy fabric. 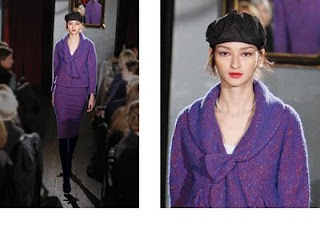 I love that purple boucle.
! @# Carolyn, I was trying not to look!!!!! Oh well, it's only money. Beautiful fabrics! I am suppose to be on a plan here - thanks for putting us in the know. And yes, you are an enabler. (I really wasn't going to make a comment) I had just ordered fabric yesterday from fabric.com(they have sales every wednesday). I actually stop by their website before stopping by your blog just to see what kind of sales they had today. I wasn't excited; probably because two weeks ago I had order about a trillion yards of fabric that was on sale for 1.99 yd. Turned out to be really nice fabric. Mostly polyster suiting and some cottons. I really can't find room for anymore fabric. But will that stop me! NO! I think I'll return to their website and look at vera lavender collection again. Ha! I was on the site this morning - believe me my cart was full. But, I finally talked myself out of getting anything because I have so much fabric. Then I read this post.... so hard to resist. Thank you for the info. I couldn't resist. I am doing the tan and chartreuse fabrics. Oh, I don't even want to look. I'm trying to a little extra to spend in NYC! Oh, bother, I'll go take a peek . . . I can't resist, your enthusiam has gotten the better of me. Besides, it's been icky and rainy here, too. Of course I had to look! But I was really good - only 9 yards. :-) I bought two pieces of jersey and the "Scratches" silk twill. Ha! My husband says the same thing about fabric vs therapy :) I got some of the gray wool jersey (I've been looking for this forever!) and the sage-green houndstooth. And some denim. Now I'm trying to resist the 6.95/yd wools at FFC. I'm quilty too. Fabric.com is the devil. OMG! I've seen Kashi twice in one week and now this. I couldn't resist and bought the purple suiting, some lace and lining to go with it, and floral brocade. I've got the stash fever bad! Thanks for pointing out that sale. It was great! Carolyn, just send me an email before you put up posts about your compulsive online fabric shopping. That way I won't read them and sit at my desk screaming "oh my god, Carolyn, you have lots of fabric already!!" I can't help it; I'm pretty much a fabric teetotaler. You'd be dismayed at how small my stash is. I just deleted the sale email when I saw it in my inbox, but now that everyone is posting such great fabrics on sale...I may have to go check it out! Thanks!!! You're going to LOVE it! I had ordered some of the jersey before it went on sale and it is absolutely yummy. I couldn't use it for my project because it's too nice to it for the original project I had in mind... I need to save it for something special! We've all seen what has happened to the auto industry when no one buys cars. I'm sure that none of us wants the same for the Fabric Stores. Therefore, it is our duty to stimulate the economy by purchasing fabric,patterns & notions without delay. I'm serious! After you posted this fabric collection find on SG I took a look. The fabrics online are TDF. I put a bunch on the design wall and left them alone but then when the sale e-mail came it was time to take action! So I have 23 yards coming this way. I went similarly nuts - I picked up seersucker and pique for now, and enough for three dresses, 2 skirt suits, and 2 coats for fall. The colors they had in the Vera collection are all fantastic red head colors and I definitely overindulged... glad I'm not the only one! LOL, will you believe me when I tell you that I looked at all of it and came away empty handed? Not that some of it isn't nice stuff, but, I'm starting to get a bit realistic... really! It's Show and Tell Week! The Chadwicks Dress is finished!